I’m no expert, but I honestly believe that traveling as a couple is one of the best and most fun ways to challenge a relationship. I don’t mean that taking an all-inclusive vacation with your significant other will ensure your relationship stands the test of time. I mean to travel like you mean it…like you want to understand the culture and experience all there is to offer. There is no specific duration needed to experience this sensation, although the longer you do something, the more likely it is that something will go wrong. And I’m definitely not hoping that things go wrong when traveling, but they do. So just look at it as an opportunity to overcome an obstacle as a couple and make your relationship even stronger! Everyone’s circumstances are different, but generally both people will be out of their comfort zone and forced to deal with the unexpected issues that are almost certainly going to occur. Whether it’s something as simple as sharing one bathroom when one (or both) of you gets food poisoning, or getting completely lost with no cell phone service…your relationship will certainly find new bounds and a deeper understanding for each other’s quirks . Some of you planners out there may think that preparing and booking everything in advance will prove to make your trip worry free. But the reality is that things go wrong, no matter how much effort you put into planning! That doesn’t mean that the juice isn’t worth the squeeze…it is….the juice is soooo good…the best! But some things are simply out of your control, much like the unpredictable challenges that you are bound to face throughout life. Travelling can bring out the best…and worst in people, depending on the situation. In stressful circumstances, people really show their true colors. Some barely flutter an eye, while others just want to break down and cry. No matter what type of profile you fit, your partner should be someone who gets you through these situations and makes you better as a team. 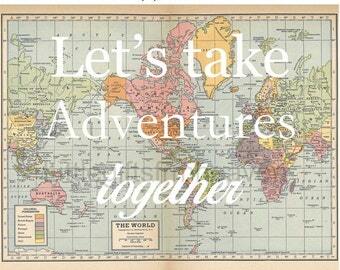 By going on an adventure together, you truly get to know all sides of each other. Had to test the relationship in New Zealand ;) it was rough.